Esmeralda County spans a total area of 3,581.88 square miles, with over 97% of the County’s total area managed by the federal government. Goldfield is the county seat. The 2010 U.S. Census estimaged Esmeralda County’s population to be 783, averaging 0.2 people per square mile. Approximately 80% of the population is dispersed among its three most populous towns: Goldfield (268), Dyer (259) and Silver Peak (107). Esmeralda County’s history is closely tied to its mineral wealth, particularly gold and to a lesser extent silver. Esmeralda County’s economic foundation has throughout its history consisted of four primary areas: mining, agriculture, government, and tourism. Leaders of the County have expressed continuing concern over the need to diversify and expand the regional economy. Esmeralda County’s power is provided by two large entities, Sierra Pacific Power Company (doing business as NV Energy) and Valley Electric Association (VEA). NV Energy services north/northeast Esmeralda County, which includes Goldfield and the Silverpeak area. Southern and western Esmeralda County, which includes the communities of Dyer and Lida, resides in District 4 of VEA’s service territory. Esmeralda County possesses ample geothermal and solar energy potential. 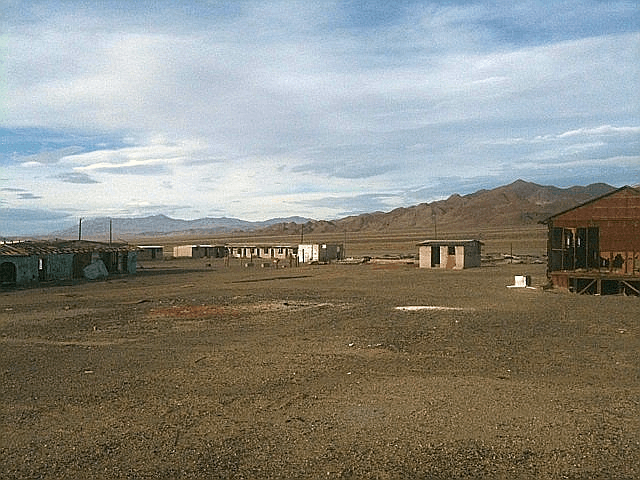 The County does not have zoning requirements and affords developers potential transmission access to California through the NV Energy and Southern California Edison interconnect (55kV) in Clayton Valley, if the transmission line were to be upgraded. The RDSBC Esmeralda County, NV Renewable Energy Resources map (right) shows solar resources for Concentrating Solar Power (CPS) and tilted Photovoltaic (PV), favorability for Geothermal Potential, annual average Wind Resource at 50-meter height above ground surface, Great Basin Pinyon-Juniper Woodland as a Biomass energy source, and transmission lines and substations for capacities 230 kV or greater. 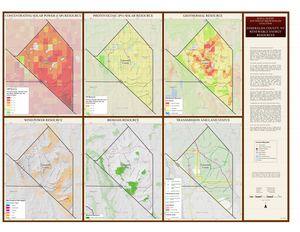 CLICK here or on the map image to view or download the 34″ x 44″ PDF version of the map. Please note: the file is large and may take a while to display. Biomass: Esmeralda County has potential biomass in the form of evergreen forest and deciduous forest (White Mountain only) at higher elevations located on the White Mountains, the Silver Peak Range, Palmetto Mountains, Montezuma Range, and Magruder Mountain (Renewable Energy Maps of Nevada, 2007). Geothermal: Portions of central and west-central Esmeralda County are known or suspected to have excellent geothermal resources primarily at lower lying elevations. Three geothermal power plants are planned or under development. The ALUM project (GeothermalEx) is expected to start production in 2013 with a confidence level of 90% for a 33 megawatt (MW) plant and 50% for a 68 MW plant. The Silver Peak Project (GeothermalEx) is expected to start in 2013 with a confidence level of 90% for a 15 MW plant and 50% for a 42 MW plant. The Clayton Valley project (Ram Power, Inc.) would be located approximately 25 miles southwest of Tonopah. The plant would be an air cooled binary type power plant which would reduce water needs and emissions. The project would be spread over approximately 82, 496 acres of leased land and would have the potential to produce up to 160 MW of power through the use of multiple plants. The project would also have the ability to tie into the Millers Substation through an 11 mile generator tie line. Solar: Esmeralda County has several valleys which have been identified as having a high solar power potential (GE 7.0 kWh/M2 per day), according to the Renewable Energy Maps of Nevada (2007). Two Solar Energy Zones (SEZs), Millers and Gold Point, are located in Esmeralda County, as identified in the Final Solar Energy Development Programmatic Environmental Impact Statement (EIS). The Millers SEZ is about 15 miles west of Tonopah and is traversed by a 120 kilovolt (kV) transmission line. It consists of 16,534 acres of developable land. The Gold Point SEZ is located 50 miles south of Tonopah and is approximately 3 miles west of a 345 kV line. It consists of 4,596 acres of developable land. Wind: Esmeralda County has many possible locations, usually located in higher elevations, for wind turbines. These areas are generally associated with the County’s larger mountain ranges, though the densest areas of identified wind resources are in southern Esmeralda County. Most wind energy developments with wind turbines 200 feet above ground level will be required to coordinate with Nellis Air Force Base (Renewable Energy Maps of Nevada, 2007). Iberdrola Renewable is currently assessing its 10,000 acre right of way (ROW) with the installation of meteorological towers. Transmission: Esmeralda County is traversed by a 120 kV line and six 55 kV lines. A single 55 kV line is the only interconnect between Nevada Coalition counties and Inyo County, California. A PDF version of a table summarizing Esmeralda County Load Service Utility Information for the two load serving utilities in Esmeralda County: NV Energy and Valley Electric Association. 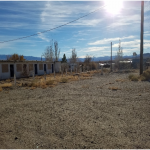 Esmeralda County has four assessed Brownfield properties: Coaldale Junction Truck Stop, the Dew Drop Inn, Old Gas Stations and Convenience Store, and Silver Peak Motel. Coaldale Junction Truck Stop (006-161-09). 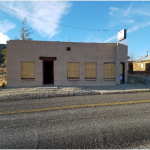 The property is a former truck stop located near the intersection of U.S. Highway 95 and U.S. Highway 6, approximately 50 miles west of Tonopah, Nevada. Although the exact date of construction of the truck stop is unknown, records indicate the site became operational in the 1960s. 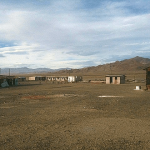 The site has been abandoned since the mid-1990s and has never been operated by Esmeralda County or the current owner. A Phase I Environmental Site Assessment (ESA) was completed in December 2012. A Phase II ESA was completed in September 2013. Findings included contamination from total petroleum hydrocarbons int he soil and groundwater as well as lead and asbestos materials in the buildings. Remnants from the former truck stop include a cafe, motel, and diesel/gasoline retail facilities. 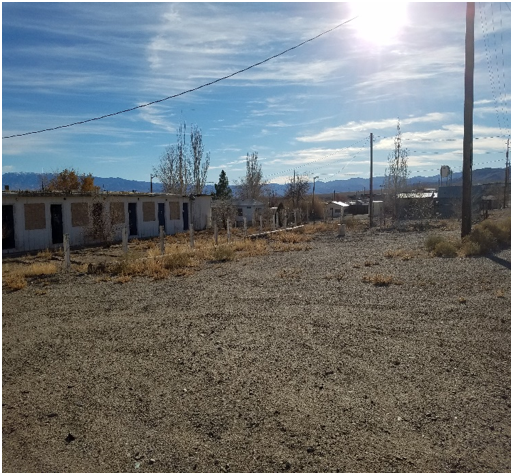 Coordination is ongoing between the RDSBC, the property owner, Esmeralda County, and the Nevada Division of Environmental Protection to determine the best redevelopment options for the property. 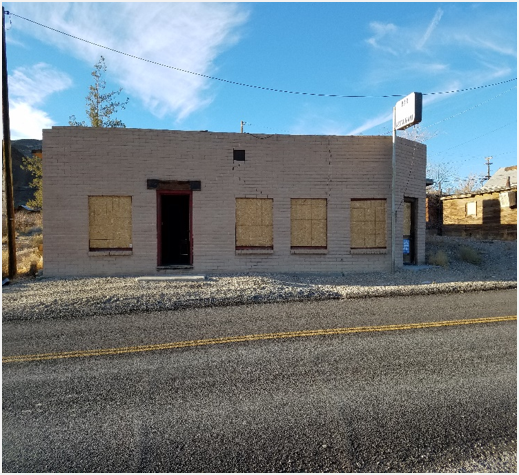 Dew Drop Inn in Silver Peak, Esmeralda County, Nevada. The Dew Drop Inn building, constructed in 1974, and the Shifting Sands Bar, constructed in 1949, were operated as a restaurant and bar until the 1980s. A Phase I Environmental Site Assessment (ESA) was completed in December 2016 to identify recognized environmental conditions that may be present due to past or present land use of the site, and/or properties in the site vicinity. 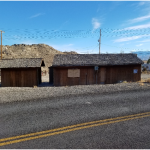 The findings from the Phase I recommended additional environmental investigation due to suspected petroleum hydrocarbons, asbestos containing materials, underground storage tank, and possible vapor intrusion at the Dew Drop Inn. Phase II activities were ongoing at the end of the grant period. Environmental reports are available upon request. 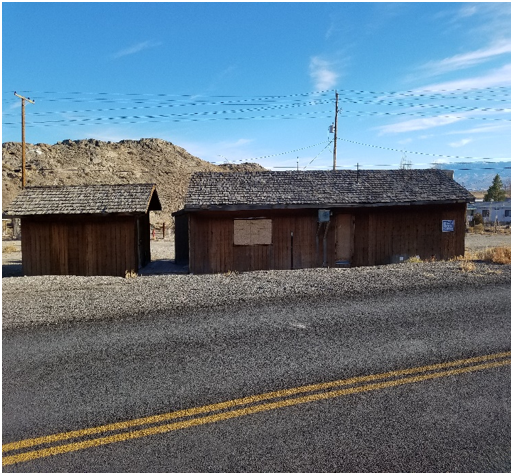 Old Gas Station and Convenience Store in Silver Peak, Esmeralda County, Nevada. Old Gas Station and Convenience Store (002-053-01 and 002-053-02). The site was first developed in the late 1940s and was used as a gas station and limited-inventory convenience store throughout its history. A Phase I Environmental Site Assessment (ESA) was completed in December 2016. The Phase I recommended further assessments to identify any potential release of petroleum hydrocarbons commingled with lead into the subsurface of the subject site. Phase II activities were ongoing at the end of this grant period. Environmental reports are available upon request. Silver Peak Motel, Esmeralda County, Nevada. The site was first developed in 1988 and was operated as the Silver Peak Motel until the 1990s. The site has not been operated since the motel closed. A Phase I Environmental Site Assessment (ESA) was completed in December 2016 to identify recognized environmental conditions that may be present due to past or present land use of the site, and/or properties in the site vicinity. The findings from the Phase I did not warrant additional environmental investigation. Environmental reports are available upon request.